This page has information on Super Nintendo consoles that have the “SNS-CPU-1CHIP” motherboards, which are known for their higher quality video output. All 1CHIP consoles output a signal that’s too bright. This can result in an image that’s slightly washed out, or shows signs of “ringing”. In fact, it’s possible that this is a big part of the reason some people think SNES Mini’s look better then 1CHIP’s. Luckily, the fix is extremely easy! – Disassemble the 1CHIP console and flip the board over. – Solder three 750 Ohm resistors to the holes and then solder all of them to the ground point shown in the picture. FLUX WILL MAKE THIS MUCH EASIER!!! – Make SURE to trim any of the resistors that are sticking out the other end. 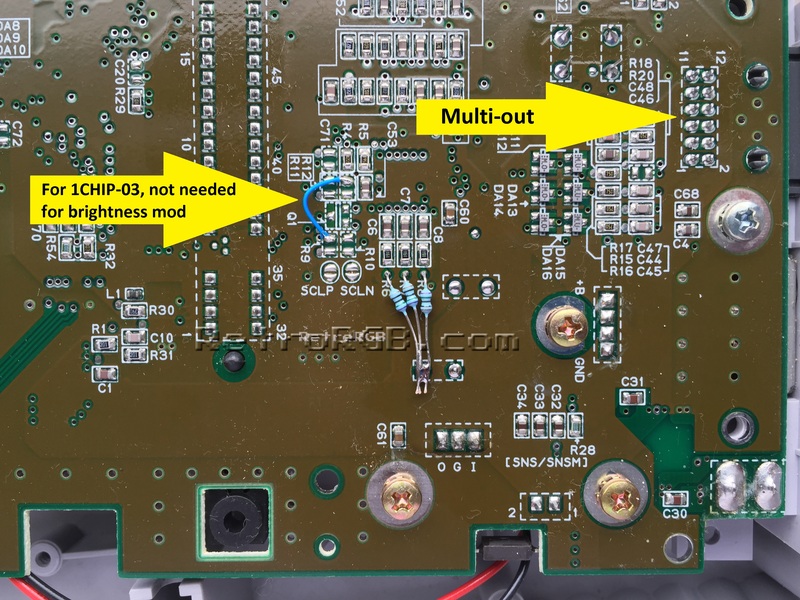 If you have a 1CHIP-03, you’ll want to consider using a sync-on-luma cable, restoring the entire circuit on the motherboard, or using an RGB bypass board that includes the full csync circuit. The THS7314 amp is commonly used in many modding projects, as it’s cheap and easy to assemble. It’s a good quality amp and learning how to make your own might be fun for any DIY’ers. Click here for a guide on how to install one in a 1CHIP SNES. People have integrated the THS7314 into their own pre-made board. This guide specifically shows how to install Borti’s board, however the basic instructions will be the same for pretty much anything similar. Feel free to go back to the main SNES page. If you’d like info on mods for other systems, head to the Getting RGB From Each System page or check out the main page for more retro-awesomeness. Super Nintendo Entertainment System SNES Console Bundle TESTED!